A lot of people don’t know how crisp and refreshing fennel is. I go to my local Whole Foods and I see person after person passing it right over, not even stopping to see its name. Fennel can be intimidating- it looks weird and isn’t easily recognizable- but it is actually really easy to handle! Raw fennel tastes slightly of licorice, and when fresh, is delightfully crisp. Roasted fennel has a more complex flavor, but I personally prefer it raw as part of a salad. Watch this video to learn how to cut fennel, and then visit my latest Babycenter post to learn how to make a fennel salad. As winter goes on and the abundance of produce diminishes… don’t despair! Fennel will be there! The end of the video has a funny guest appearance. My cousin and I were testing out my new camera and the result was too awkwardly funny to not include. We were being dorks. Enjoy! Have you ever tried fennel? Do you like it?! Great tutorial! I love fennel but hardly ever prepare it. I really do like fennel but end up wasting it because of cutting it! Thanks for the tip! I’ve never tried fennel, but I am tempted. Adding it to a salad raw sounds like a delicious way to try it out! Great video 🙂 I have never cooked with fennel. I love how much light you get in your kitchen- just awesome! 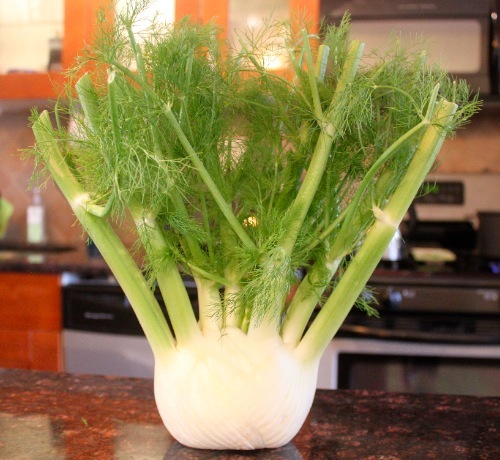 Thanks Sabrina – I’ve never bought fennel before but it looks pretty easy now! I LOVE fennel and eat it both in salad and roasted. I’m a HUGE fan. We eat fennel pretty often, with apples in salads or chopped with mustard, white wine, and scallops. I also just love snacking on it; it is so refreshing! I have never had fennel, but I will have to give it a try. At the end you mention it’s also known as Anise so I’m assuming anise seed is from fennel? I have to admit I am typically not much of a fennel fan. I don’t really care for it raw, though roasted it’s much more pleasant to me. I think it’s because in general, the anise taste is not my thing, but I find this flavor mellows when it gets caramelized either on the stovetop or in the oven. Sabrina- thanks soooo much for this! I LOVE fennel. it brings me back to my childhood days- i had a best friend whose mama was authentic french and dad was swiss. EVERY meal, snack etc. there was fresh yummy and unfortunately un-repeatable until now! My friend’s mom used to make fennel salad with freshly baked french bread (which i am not ready to attempt) and now i can re-create at home! I LOVE how you have taught me (and im sure others) to enjoy food as/with memories. thank you so much. PS: LOVE the spot on babycenter! Great job with that- great posts! omg hilarious too by the way- i also never knew this was anise! I actually dont usually like anise seed but like fennel!?!? huh?! I love how your cousin goes “ooooh” at the end of the video. Too funny! Great video! You can actually put the fennel fronds (the leafy looking part of the green stems) in salads instead of throwing it away. I think I have seen some Giada de Laurentiis recipes that use the fronds, too. Love fennel and loved the video!!! Love the video 🙂 I used to not like it, but it’s definintely been growing on me the past few years! Plus I had this AMAZING goat cheese spread with carmalizd onions and fennel and I want to re-create it this weekend so this is great! I’ve eaten fennel in salads while out and loved it, so wanted to try at hm, ur video was great now I know how to prepare fennel. Well done!